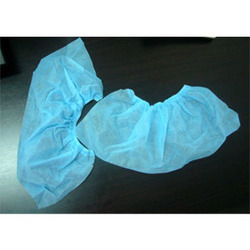 We are offering our customers with an extensive and qualitative collection of Non-Woven Shoe Covers & Cap. Further, we offer the entire range in a customized form as per the details given by our patrons. We are amongst the leading manufacturer and supplier of premium array of Non-Woven Shoe Covers. These covers can be availed from our organization in various dimensions and colors as per the demands of our esteemed clients.We provide products to the customers after testing them on several parameters under the vigilance of our quality controllers. With latest technology and professional team members, our organization is well-known for offering a wide assortment of high quality Non-Woven Cap to our valuable clients. Moreover, our sternly tested range of these covers is offered in safe packaging and within the committed time frame. 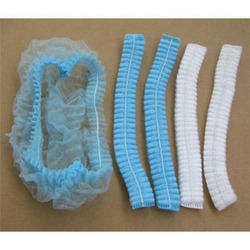 Adjustable soft thread elastic for comfort fittings, avoids escape of hair, dandruff and micro organisms during process. These caps are made from spun bond polymer non-woven fabric. This material is preferred for its light weight. Its gravity is lighter than hydrophobic PP fibers so it has excellent water repellency and air permeability resulting in providing comfort & dryness resulting in anti bacterial and anti fungal resistance. PP Spun Bond Fabric Blue Free 30-40 Gsm 100 in one Packet. Looking for Non-Woven Shoe Covers & Cap ?